NOW has a new batch of “Forward NOW” t-shirts in, and can order more. Great when getting together to rally, protest, march, attend a meeting, or go to lunch! $20 each, discount if you buy 3 or more at a time. Here is the front and back of the t-shirt. To order one or more t-shirts, use the NC NOW T-Shirt Order Form. Be sure to mark your sizes and quantities for each t-shirt – S, M, L, XL, 2XL, 3XL. Did you join us at the Women’s March On Raleigh? Did you know we made 2 styles of t-shirts for the march? Bet you couldn’t see mine under my turquoise boa! Very few were available before the march (you had to individually order your own). 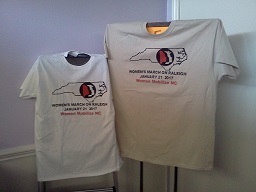 Now, Raleigh NOW has a batch in both styles of Women’s March On Raleigh (WMOR) t-shirts available. The WMOR t-shirts cost $20. The sand color shirt is unisex, boxy cut, sizes from Small to 2XL. The white color shirt is “lady’s cut,” sizes from Small to XL. Lady’s cut runs much smaller, as you may know.